You may have heard of a little movement called “Impressionism,” which grabbed Paris by the baguette in the late 19th century. Funny story behind the name “Impressionism”: It all started when Claude Monet took his easel and canvas outside and painted a couple of boats in the sunset. Lo and behold…a movement is born! Well, it doesn’t just boil down to Monet daubing bits of broken colour on his canvas…not quite. It was a mean art critic named Louis Leroy who saw the painting in 1874 and quilled down these harsh words: “Wallpaper in its embryonic state is more finished than that seascape.” Rude. But it gets worse…the critic dubbed this painting and all others like it to be mere “impressions” because the paint was so sketchily applied and the works were so unfinished. It was this that led Monet and his rebel contemporaries to be labeled Impressionists. Dunno how the critic would feel if he were alive today and saw how his acid quill had made an addition so epic to art history. In 2014, a nerdy professor over in Texas managed to figure out the exact time at which the painting was made. It was 7:35 a.m., in case you’re wondering. The impressionist emblem has long been a much-coveted object by art thieves, and the painting was stolen in 1985 in an armed robbery, along with Renoir’s Bathers and several more. Apparently, the gunmen leading the heist left the guards trembling with mortal fear. Makes sense…if you’re going to steal some priceless art, make sure you scare the bejesus out of everyone to cover up your tracks. A Japanese criminal mastermind who went by the name Shuinichi Fujikama was the brains behind the operation. Turns out he couldn’t hold on to these babies because in 1991, Monet’s pivotal piece was discovered in Corsica. And we’re happy to say that the work is back in its Museumly place, undamaged and unharmed aside from some yellowed overtones on the varnish that have been removed by superheroes aka restoration experts. Today, Impressionism is one of the most well known and beloved movements in Western Art. But in 1872, when Claude Monet was painting a hazy interpretation of the seaport in his hometown of Le Havre in France, the birth of a movement was far from his mind. Monet was interested in light. And so Monet threw himself into the study of reflections of light on water, with the port as his perfect subject. In his words, Monet painted "during dawn, day, dusk, and dark and from varying viewpoints, some from the water itself and others from a hotel room looking down over the port." It was practice — an experiement. Two years later, Monet was organizing an independant exhibition of artists who were experimenting like him. Degas, Pissarro, Renoir, and Sisley, all contributed work painted in a new style, focused on light, and usually painted outside, thanks to the recently invented portable paint tube. When Monet was asked to name his painting, he accidentially coined a term that would define the movement. "They asked me for a title for the catalogue, it couldn't really be taken for a view of Le Havre, and I said: 'Put Impression.'" Impression, Sunrise (French: Impression, soleil levant) is a painting by Claude Monet first shown at what would become known as the "Exhibition of the Impressionists" in Paris in April, 1874. The painting is credited with inspiring the name of the Impressionist movement. Impression, Sunrise depicts the port of Le Havre, Monet's hometown. It is now displayed at the Musée Marmottan Monet in Paris. Monet visited his hometown of Le Havre in the Northwest of France in 1872 and proceeded to create a series of works depicting the port of Le Havre. The six painted canvases depict the port "during dawn, day, dusk, and dark and from varying viewpoints, some from the water itself and others from a hotel room looking down over the port". 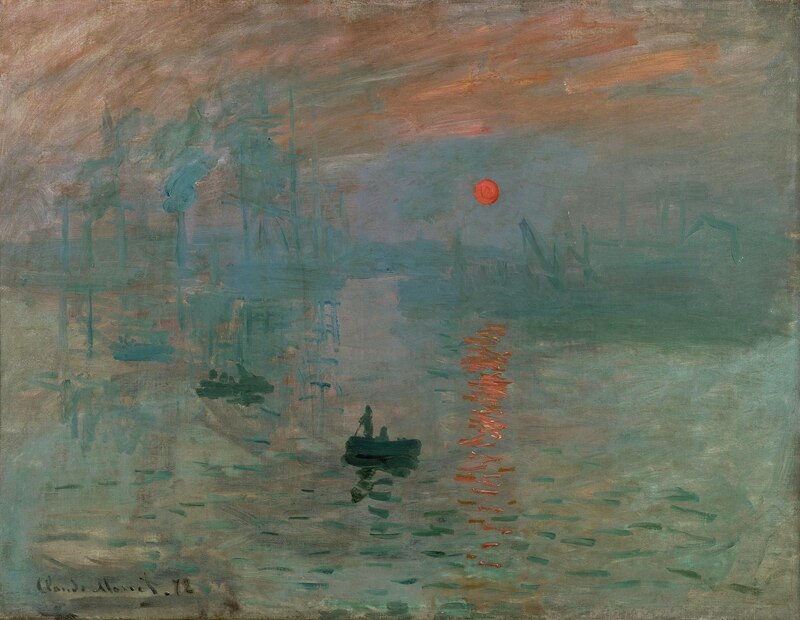 Impression, Sunrise became the most famous in the series after being debuted in April 1874 in Paris at an exhibition by the group "Painters, Sculptors, Engravers etc. Inc." Among thirty participants, the exhibition was led by Monet, Edgar Degas, Camille Pissarro, Pierre-Auguste Renoir, and Alfred Sisley, and showed over two hundred works that were seen by about 4,000 people, including some rather unsympathetic critics. In 1985 the painting was stolen from the Musée Marmottan Monet by Philippe Jamin and Youssef Khimoun. It was recovered and returned to the museum in 1990, and put back on display in 1991. Check out the full Wikipedia article about Impression, Sunrise.